The Ulf is an attractive design element in any home. It is engineered to be placed free standing and has no visible panels on any side. Power and audio cables exit from below. 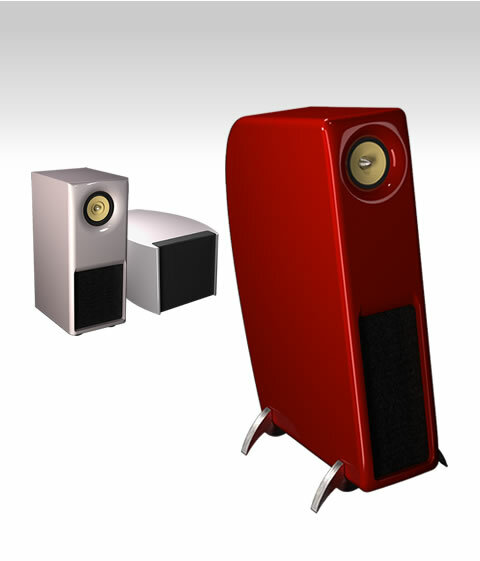 The Ulf is available in two distinct designs, a high-tech aluminum look or in Earo standard high gloss finishes in Piano Black, Pearl Blizzard White, Ferrari Red or Yves Klein Blue. The Ulf is a full range unit and will play down to 55 Hz and can be used on their own or in conjunction with a sub-bass system such as E-Low. Application is primarily for high definition 2channel listening. However, the accurate imaging makes it suitable for use as main units in performance critical home theater applications. Since The Ulf is an active speaker no power amplifier is required why units can easily be placed in other rooms and tied together by the now widely available networked sound systems. For qualitative listening, the listener to speaker distance shall produce a like-side triangle. Avoid placement in relative proximity of corners or backed against a wall. Ideal listening distance is 2-3,5 meters.